Oh Gronk, I don't care if this was staged at all. That is the best press briefing the White House has had since it got into office. They should have cut it off right after this happened. 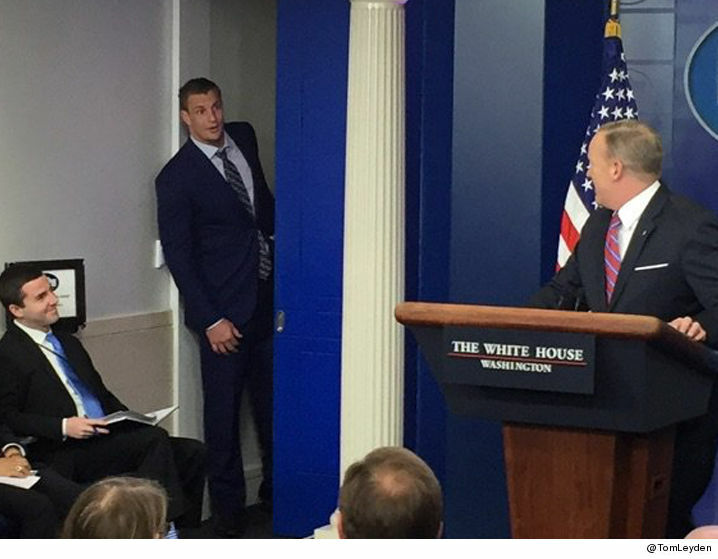 Spicer seemed like a normal guy for an entire 30 second span, that's the power of Gronk. I may hate the Patriots for their winning ways and their ability to turn players casted off as outcasts into pro bowlers, but I can't hate Gronk. The guy just has a personality that can't be beat. I mean everyone in that press room laughed and partly were hoping that Spicy would ask for some help. I'll tell you what, if Gronk was press secretary the American people would probably get simplified answers with a great bass drop in the middle.